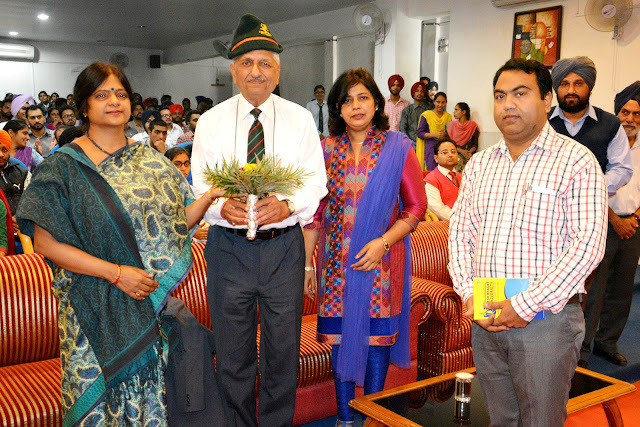 Desh Bhagat University organised a Guest Lecture on ‘Disaster Management’. A large number of students from different faculties along with their teachers attended it. The key-note speaker on this occasion was Major General (Retd.) Raj Kaushal, who is a Senior Specialist (Policy and Plans) in the National Disaster Management Authority (NDMA), Ministry of Home Affairs , Govt. of India. University Vice Chancellor Dr. Shalini Gupta welcomed him and hoped that the students will take full benefit of his experiences. The learned speaker explained to the students & the faculty members how National Disaster Management Authority is playing an important role to save precious lives during natural calamities. He said that Govt. of India established National institute of Disaster Management (NIDM) in 1995, aiming to train the people for quick reaction after calamities like Earth Quakes, Floods, Land Slides and Tsunami etc. While focusing on the topic, he said that some calamities are natural but now most of the calamities are manmade. Due to continuous cutting of trees and destruction of natural resources are main causes behind these calamities. Gases emitted by Industries, Refrigerators and A.C’s are harmful for Ozone Layer and Industries are producing poisoness waste. These are few main causes behind calamities and we can manage these only if we grow maximum trees and protect them as well, he added. He also briefed about the awareness camps being organised by National Disaster Management Authority. He also shared with the students some important tips about disaster management and his experiences. The lecture was followed by a range of queries put forward by the students to which the learned speaker aptly replied. The students were quite happy to attend the lecture. University Chancellor, Dr. Zora Singh and Pro Chancellor Tejinder Kaur expressed the view that the University aims to make prepare the students for every situation. They further articulated that such events are very useful for their multi- dimensional growth. At the end, Director (Academics) Dr. Rajesh Goyal and Dean (Student Well fare) thanked the learned speaker and hoped that the event will prove quite useful for the students and the faculty members as well.